Photo via Vice News, originally via AP. A week has passed since violence struck Jalisco’s capital, Guadalajara, and many other points in the state including its biggest tourist beach draw, Puerto Vallarta. 4 neighboring states were affected as well: Colima, Guanajuato, Michoacán, and Nayarit. As life has returned to “normal” here in the city (more or less), we think it prudent to review what the violence was and also what it wasn’t, instead of allowing fear and news sensationalism to get the better of all of us. So what actually took place? In short, buses, personal vehicles, semis and other heavy vehicles, bank branches, and gas stations were burned to skeletons in Guadalajara and across the state. In addition to property damage, the narcobloqueos (narco roadblocks or blockades) resulted in horrendous traffic into and out of Guadalajara and Jalisco, costing some local residents we spoke with 11 hours in getting to the coast, a trip which should normally take about 4 hours only. A military helicopter was shot down, ending the lives of six soldiers. There were a few gun battles. In total, some 15 people, including the aforementioned military personnel, a police officer, and narcos, lost their lives, according to statements. Generally speaking, the violence in the state erupted and came to an end on Friday, with the exception of specific locations such as Puerto Vallarta, which saw continued violence into Saturday. Authorities advised people to stay home but many had already left home for the long holiday weekend, on their way elsewhere, only to get trapped in the tumult. Multiple city bus routes stopped running altogether, not wanting to chance that another one of their buses be used as a burning middle finger to the government. There was very little traffic in the city, with many civilians who stayed put in Guadalajara for the weekend choosing venture out on Friday, and with the American and Canadian consulates issuing statements and urging their citizens to likewise stay indoors. At a certain point in the day, the streets were creepily empty, causing a city of some 8 million people to resemble a ghost town. In the face of such vacant streets, one bar even tweeted that they would give anyone who visited them a free beer and encouraged locals to reclaim their city. 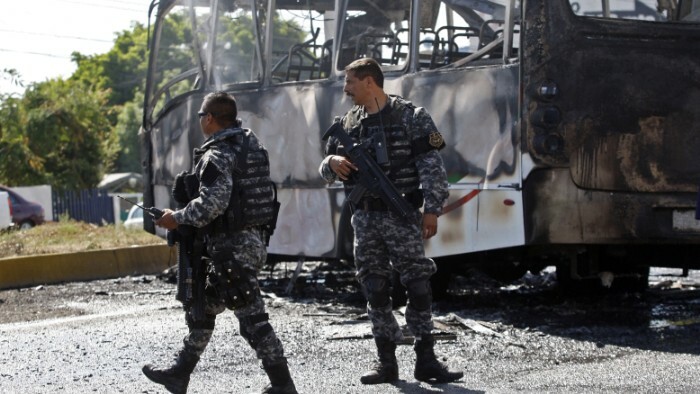 This most recent crimewave has been credited to the Cartel Nueva Generación de Jalisco (CNGJ – New Generation Cartel of Jalisco) and has been described as the worst such incident in the 3 years that such incidents have occurred, thanks to this cartel. We would have to agree. Such incidents before have been child’s play compared to what took place on May 1st of this year, claiming perhaps a few buses each previous time at most. What we witnessed last week was a full-blown coordinated attack on the city and state and it rattled people, to say the least. But here’s where the news tends to fall short, especially when violence sells – they typically fail to explain what didn’t happen. What the violence wasn’t was a coordinated attack against civilians, national or foreign. Nor was it an attack against any foreign government employees or buildings or foreign businesses. There were no known reports of looting taking place, or robberies, or “bad guys” roaming anyone’s neighborhood. Nobody was burned alive in their vehicle. In fact, as has happened before in past instances, all passengers of vehicles were ordered to get out before the vehicles themselves were set on fire in this latest salvo from the cartels. While it may certainly be argued that violence is violence and it puts everyone at risk if only because of the threat of collateral damage, we find it imperative to point out that folks like you and us were not actual targets of the violence in anyway whatsoever. One theory set forth to explain the violence is that these types of crimes are perpetrated by narcos in response to the capture of key leadership. Another theory is that this is how they “protest” government action or plans that they do not appreciate or agree with, or respond to negotiations that go sideways. Indeed, on Friday the local government announced the launch of Operación Jalisco (Operation Jalisco), an alliance across several agencies created to quash the CNGJ’s influence and power in the region, and their official statement has been to explain the violence as a reaction to the start of this operation. Either way, the narcos begin to sound like grown-up babies, throwing fits when something doesn’t go their way. A third theory presented suggests that the narcobloqueos and general burning and destruction represent a diversionary tactic to enable key cartel members or even leadership to escape capture or move about more freely. If the authorities are distracted with burning vehicles, gas stations, and banks, horrendous traffic on all sides, and the general maintenance of calm and order in the face of chaos, it makes it difficult for them to commit large forces to the chase and capture of key figures. Rumors have it that the helicopter that was shot down had spotted a convoy that contained such a key figure amongst its number, and was descending for a closer look when it was taken out of the sky. This latter theory strikes us as the most plausible. While the true explanation cannot be known with complete certainty by anyone not on the inside somehow, it is clear that this is a conflict between what some refer to as Mexico’s narco-insurgency and the political powers that be, fought by the soldiers of both sides, and civilians have thus far not become a part of that here in Jalisco. As one local mentioned, though, tourists may nevertheless choose not to take any risks in visiting Guadalajara, Puerto Vallarta, or Mexico anymore, and who can blame them. What’s more, everyday the cartels are exerting more and more control over industries such as tourism, mining, and education, exacting quotas or protection money from businesses to augment their income from the sale of narcotics and making it harder for legitimate commerce to survive. Acapulco is a shell of its once world-renowned former self due to narco-violence and extortion. The state of Guerrero where Acapulco is located is a bit of a nightmare these days. We sincerely hope Puerto Vallarta is not the next jewel to get buried, and that Jalisco is not the next state to succumb to the drug war. As for Guadalajara, we feel it is still safe enough to visit or live in by all accounts in spite of the increasing turmoil surrounding it, and we remain committed to bringing you the best this great city has to offer, but visiting or living here is a very personal decision only you can make and some hesitation is increasingly understandable. If you speak Spanish, get minute-by-minute updates on Twitter. See our recent article on this. See the announcements put out by the US Consulate in Guadalajara. Sign up for the US Bureau of Consular Affairs’ STEP alerts. Visit our Travel Alerts & Warnings resources article. For news, see The Tequila Files, Latin Correspondent, The Independent, and Vice News, to name a few.